Our microfinance bank construction services is designed to deliver quick built microfinance houses (or offices) wherever they are needed in Nigeria. Microfinance banks play a key role in developing the economy of any country. They provide the much needed small business capital that help create thousands of self-employed people within a short space of time. Consequently, microfinance banks should of necessity be close to the people. In fact, they should be widely available in multiple locations so potential customers can easily reach them and take the necessarily steps to access small business loans they need to kick-start their new businesses (or expand existing ones). The good news is . 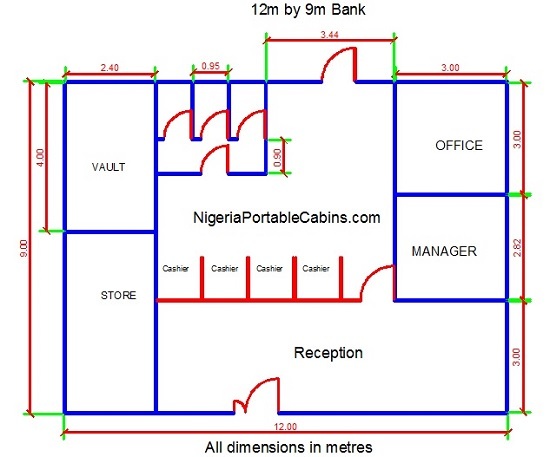 . . we provide quick built microfinance houses (or microfinance offices) that enables any Nigeria microfinance bank to spread quickly in terms of creating a huge branch network all over the country. Our microfinance bank construction services is just the right building solution any microfinance bank in Nigeria need to quickly expand their services to every nook and cranny of Nigeria. Thinking of expanding the reach of your microfinance bank using a fast and reliable portable bank building construction company? Our fast, reliable portable steel building construction service is for your bank whether you're a new comer in the Nigeria microfinance bank sector or you already have a couple of branches in Nigeria. The process to kick-start your expansion process is pretty simple. We commence the microfinance bank construction immediately we receive mobilization. And we do not stop until the work is completed and handed over to the customer. We build to our customers' specifications and we can build in multiple locations simultaneously. Ready to expand your reach and we more customers? Simply fill the form below to tell us what you want and we will send you a quote promptly.